Dear neighbors, have you ever had millet ? This gluten-free cereal comes in the form of tiny yellowish pellets. Up until recently, I would always cook it the same old way : first toasted, then cooked in a saucepan with water and always served it with some « wet » food to compensate for its dry taste, such as my celery recipe. What has your experience been with millet ? (Did I hear anyone say I’m not supposed to play with my food?) Anyway, I realized I could shape it into patties. Great ! I then proceeded to coat them, first in egg, then in a flaxseed-almond meal mixture before they went into a frying pan. I served them for our supper with some greens, slivered almonds and moozzarella. Even your other neighbor (the one with sulfite-intolerance and many issues with meatless dishes) enjoyed this totally vegetarian meal ! In this recipe, however, the vegetables go inside the patties. It’s easy : everything cooks at the same time. This is a no-fuss vegetarian recipe. I also give you a choice of gluten-free crumb coating. As for quinoa and sushi rice, I like to wash millet several times. Place in the rice steamer tray along with water. I use a quarter more water (in weight) than millet. 1. Shell peas, dice vegetables into small cubes and place in bottom tray of steamer. Place millet tray on top, cover and steam for 25 minutes. 2. 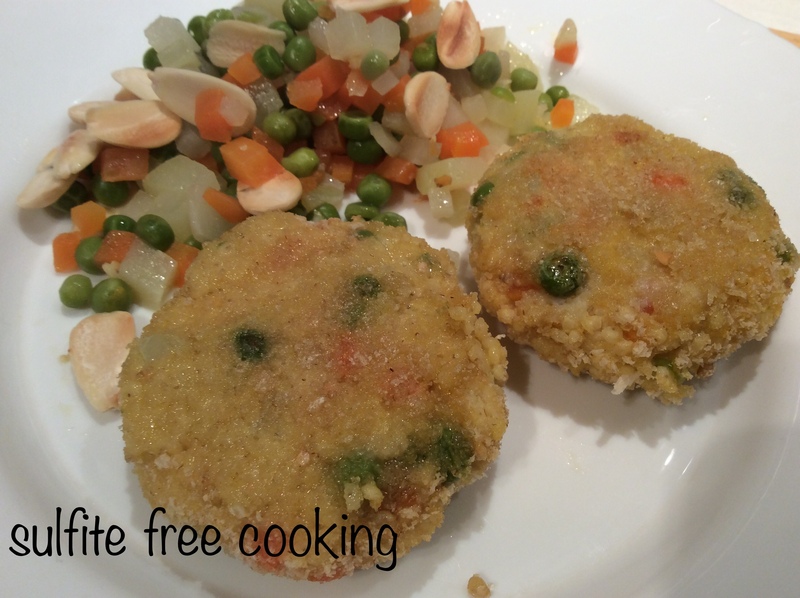 Combine cooked millet with vegetables and shape into 4 to 5 patties. Coat well with beaten egg first, then in crumb mixture. Place on a lightly oiled dish until cooking time. 3. Heat some olive oil in a skillet and fry the patties on medium-low heat, until each side take a pretty golden color. Serve with some greens and nuts for a nice vegetarian meal. I am already thinking that I will be making a plain version of these patties (no vegetables) this summer and serve them with fresh tomatoes and mozzarella. Will you join me then, dear neighbor ?